In my quest to build a stir plate using a computer cooling type fan, I found that the most difficult part of getting that to work well was mounting the magnets properly. I settled on two magnets and in spite of several attempts I was unable to get an efficient (or even stable) mount for the magnets. Magnet alignment is an important part of stir plate design. Uneven or mis-spaced magnets mean easily thrown stir bars and poor performance. 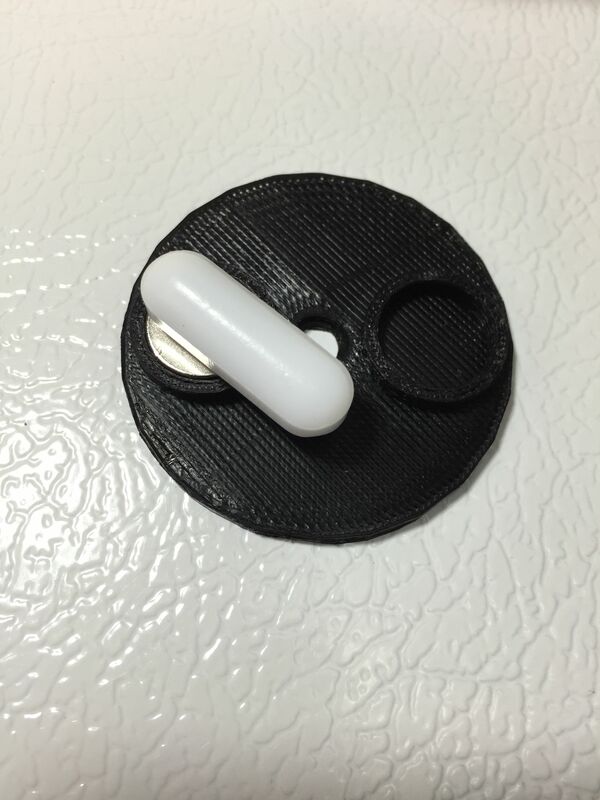 I decided to design and print a 3D printed mounting aid to make magnet mounting easier and more precise. I’ve since dubbed this the HBF Stir Plate Mounting-Thingy. In my opinion, it turned out pretty amazing. 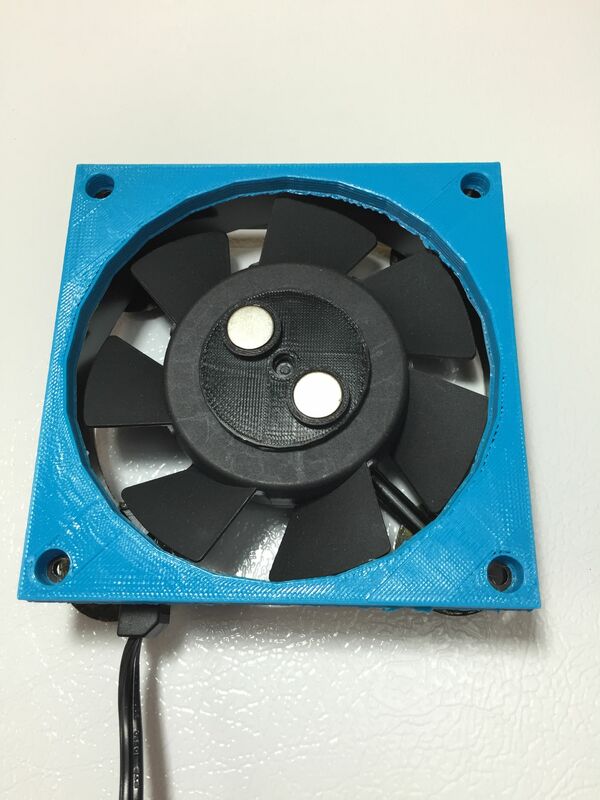 I sourced this specific cooling fan for the project. I like this model because: 1. It’s a good size (120 mm, 4.7″ square), 2. Is already wired for AC and, 3. Includes a variable speed function that can be used for controlling the stir plate speed. Of course, you could use any fan that’s compatible with the size of the mounting thingy. 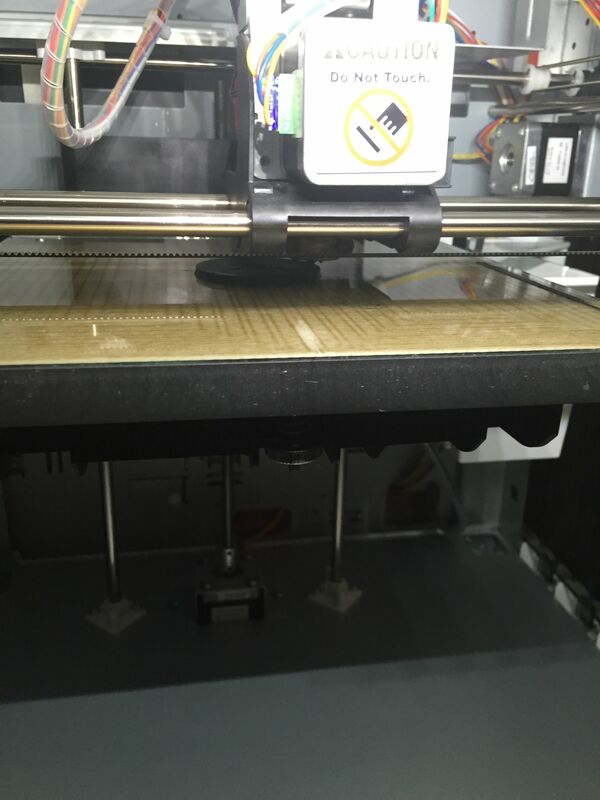 Here it is printing on my XYZprinting Da Vinci 1.0 3D Printer – check below for links to the STL file on thingiverse. Here is the completed Magnet-mounting-thingy! A close up of the finished piece. I tried several designs. 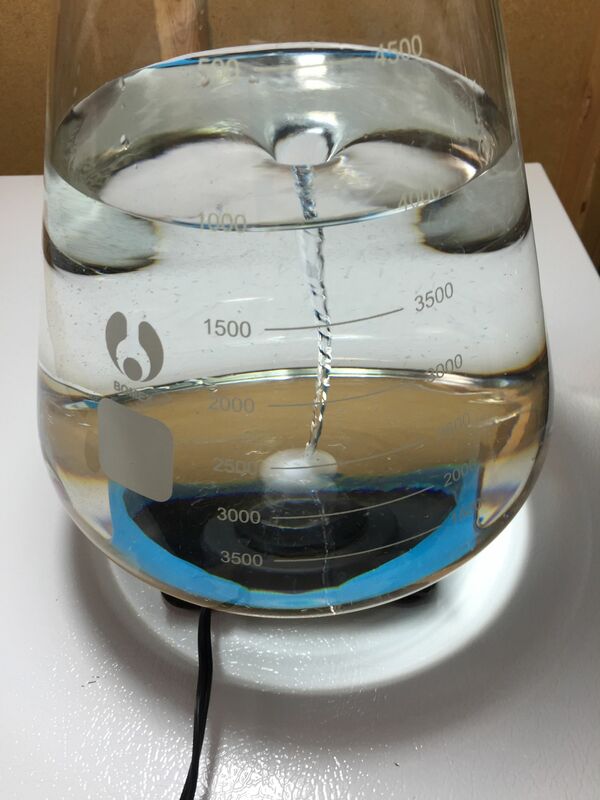 Magnet alignment is an important part of stir plate design. Uneven or mis-spaced magnets mean easily thrown stir bars. That’s not good. I figured that out on my own, trying to place magnets isn’t fun. They don’t want to cooperate. This piece helps mount magnets easily and precisely. I decided on the hole in the middle because the fan I purchased has a dimple in the exact center. 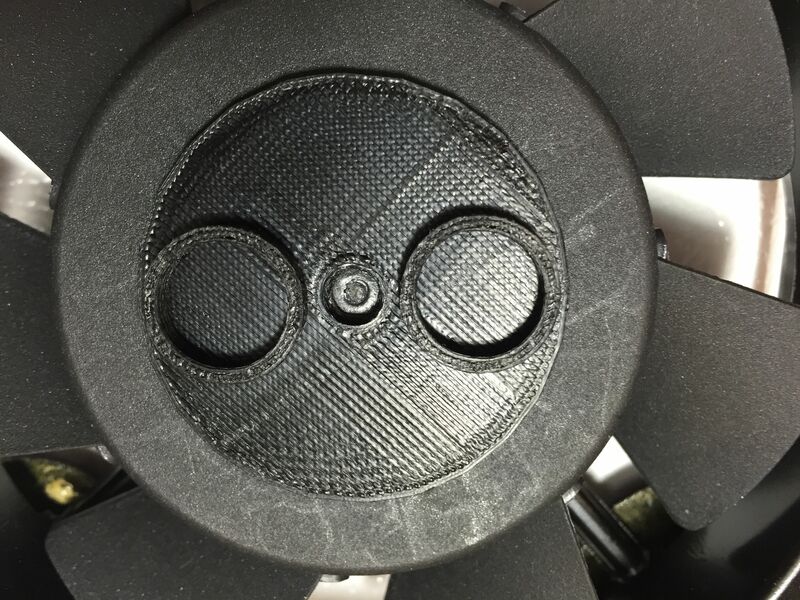 The magnets are centered and held in place on the mounting aid and alignment on the fan is as easy as lining up the dot in the center of the circle. About the magnets… I tried three different sizes of magnets. I was about to go with a smaller size that worked okay, but decided I wasn’t happy with their performance. Yes they did work on a moderately sized starter. But, I just wanted more holding power. I didn’t want to have to struggle with thrown stir bars. I decided on 1/2″ by 1/8″ Neodymimum Rare Earth Magnets. If any magic exists in this design… certainly a good bit of it comes from these magnets. The alignment and fan are both huge parts to the puzzle. But the power of these magnets is important. Note: Be careful with strong magnets. Read the warning on the box and always read and follow manufacturer’s instructions. Take special care when using these around each other and around metal in general. You want to line your magnets up so that the polarity is in agreement. I’ve done this a few times now, not always successfully I might add. Now, I start by putting the magnet on a stir bar. Get it placed so everything is nice and happy. I put this on a tasting paddle. I’m working on my deep freeze here and the magnet would prefer to make friends with the deep freeze vs the stir bar. The tasting paddle helps. Note that here and throughout these tests, I’m using this 6 x 25 mm Stir Bar. Now take the stir bar and magnet combo and place it into the holder. 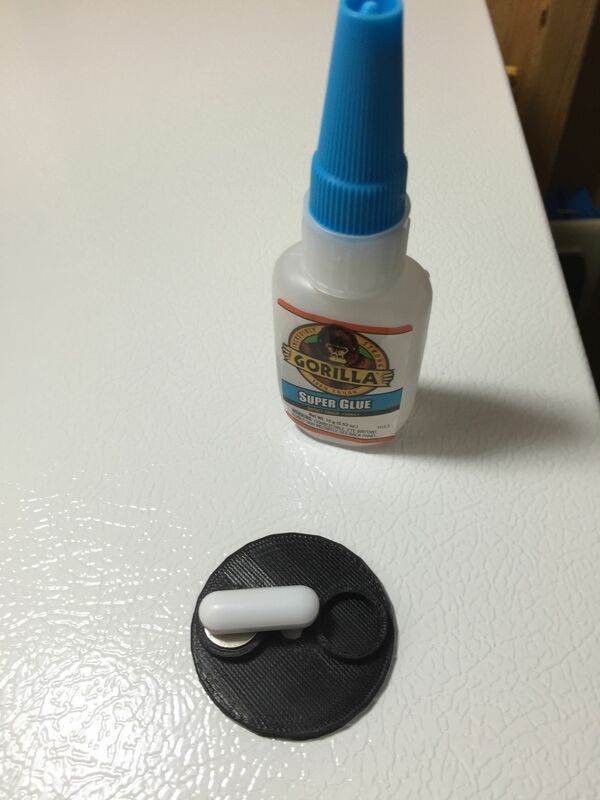 When you’re comfortable with positioning, glue the first magnet down. I’ve been using Gorilla’s Super Glue. Wait for that first magnet to set up. It’s worth noting that the individual magnet holders are tight enough (at least for me) for this specific magnet to hold them, at least temporarily, in place while you play around with positioning. Next, I take the other magnet and move it close to where it needs to go. See how the stir bar has moved to the side? That’s because the polarity was incorrect. The stir bar was repelled. Rotate the magnet around until the stir bar is attracted and you’ve found the correct position. Here, I’ve found the correct orientation for both magnets and the stir bar is attaching perfectly. Glue the second magnet into place and wait for it to set up. Notice the dimple in the middle of this fan. Disregard the scuffing on this. I’ve tried a bunch of things with this fan. The fact that it’s still working well after the paces I’ve put it through is a testament to it’s hardiness. If your fan doesn’t have a dimple, you could measure (carefully) to find the exact center of the fan and add a mark. Add some glue and line up the dimple in the center section and whammo you’re lined up and installed. With a temporary 3D printed top installed to give proper spacing. Note: I believe that it’s important to minimize distance between the magnets and your Erlenmeyer flask. Minimizing this distance helps the magnets hold the stir bar more efficiently. 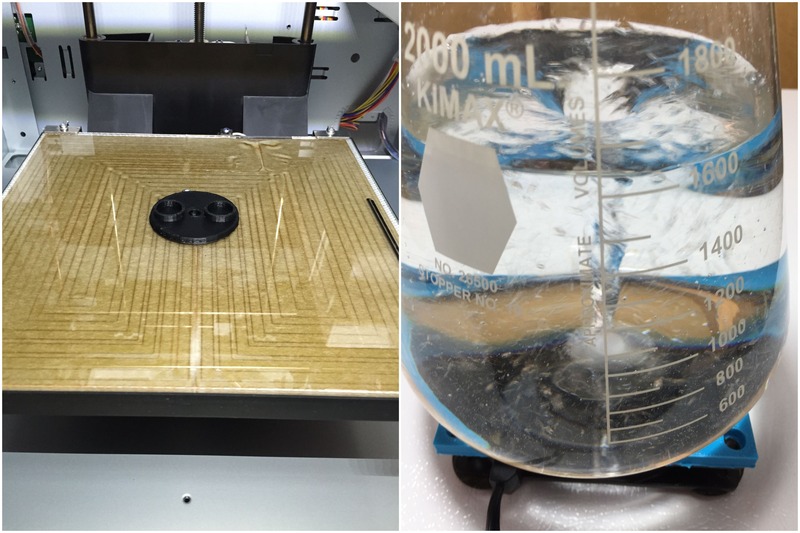 With some stir plates, it’s necessary to move the flask around a bit (with the stir bar in it) to train up the stir bar on the stir plates magnets. Not necessary with this design. Drop the stir bar in and the two immediately find each other. Here’s another picture of of the same test. This is vigorous and violent. It’s worth noting that this magnet/spacing/stir bar combination doesn’t throw stir bars (at least in my tests) even at top speed. This setup is entirely capable of holding a 5 liter Erlenemeyer and stirring large starters. 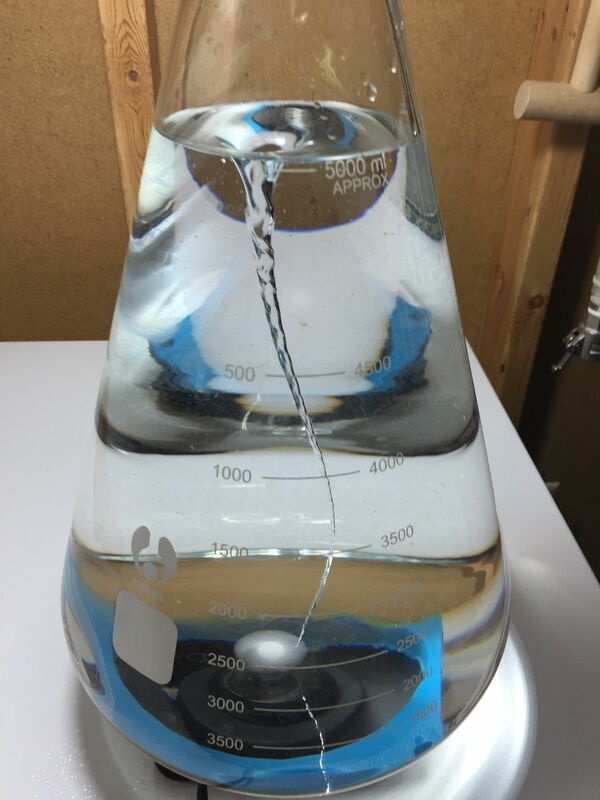 Here is a beautiful vortex with 4 Liters of Water in a 5L Erlenmeyer. How about a full 5 Liter starter? Yup! I’m very happy with these results. 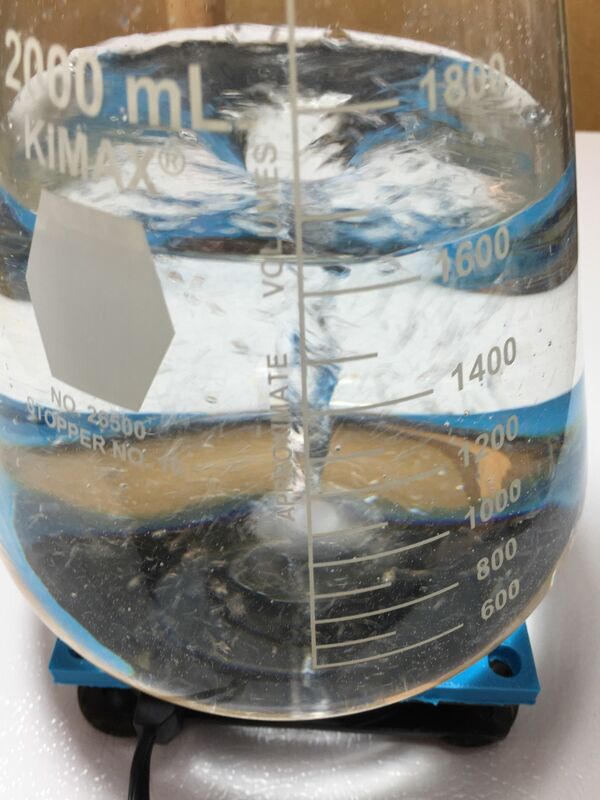 Note that this is a project that requires additional materials to build a completed stir plate. This HBF Stir Plate Mounting-Thingy is a guide designed to aid in the difficult (at least to me) task of mounting magnets accurately. STL files for this guide are available for free. 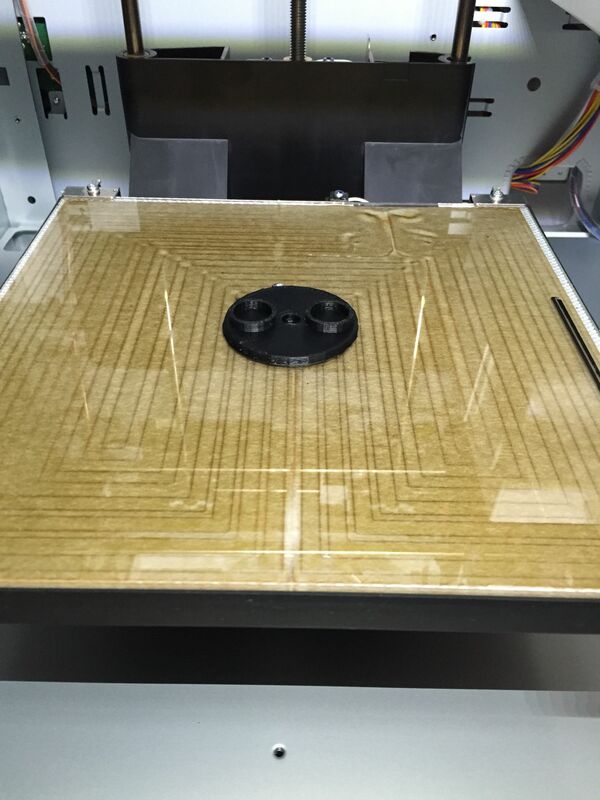 This entry was posted in Fermentation, Printing - 3D, Projects, Reviews & Top Posts, Stir Plates, Tech in Homebrewing, Top Posts on February 5, 2015 by admin. Dredging this up from the annals of history. 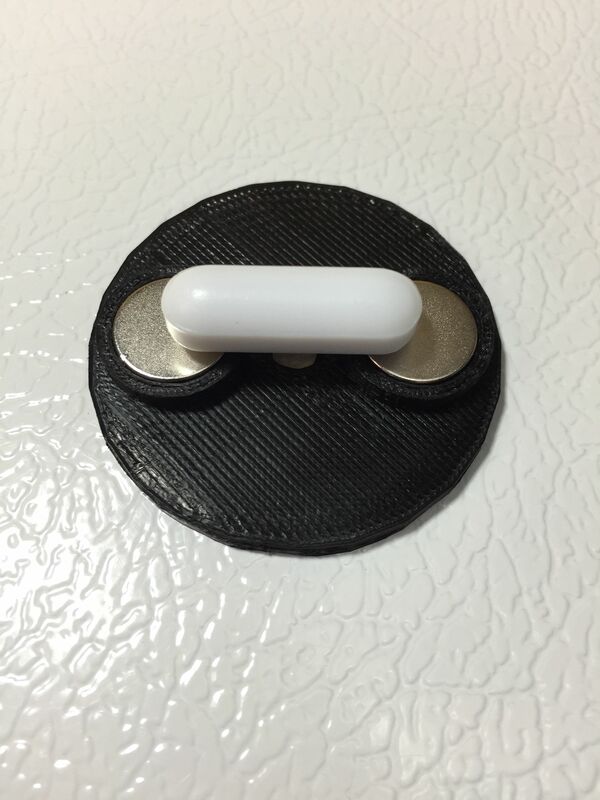 I’ve found 1/2″ magnet for sale at several online magnet retailers. The magnets are cheap, but the shipping makes them more expensive than I was willing to pay. At Home Depot, I found neodymium magnets billed as 1/2″ but actually 12mm (~0.47 inch). Quantity 6 for about $4. Lots of people live close enough to a HD that this might be a good choice for them. I suggest that those interested go to the HD web page, look up either Internet part number #202526367 or Store SKU #632137 to get the aisle and bay number whey they are stocked at their store rather than looking for them. Both of the HD near me had them in-store, but they might do free ship-to-store if other stores don’t carry them as regular stock. I was able to make the 12mm magnets work for me, but they were sloppy in their wells until the epoxy cured. Maybe another version of the mounting widget can be made with 12mm wells? 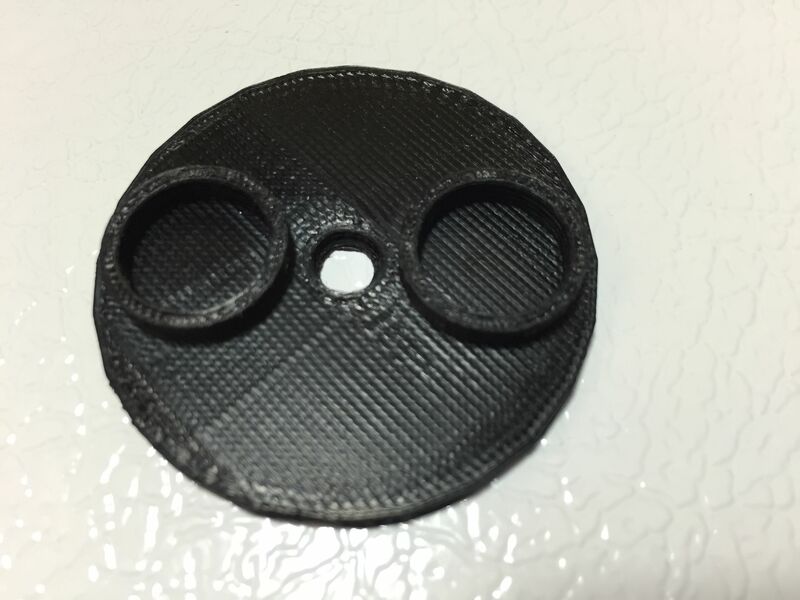 Is it possible to get a second STL file that has holders for the Magcraft NSN0674 5/8-Inch by 1/8-Inch Rare Earth magnets? Or the sketchup file? Possibly. Where are you getting these at? I’ve been at a standstill on the larger 3-D printed stir plate because every time I get a magnet it becomes unavailable to order. Amazon, but they are out of stock yet again. I built one of these using this guide. The fan is just too damn powerful, even at extremely low speeds, and kept tossing the stir bar off the magnets. I upgraded to a 2″ stir bar and same issue. I ended up shelving the project. Was using a 5L flask for my tests. 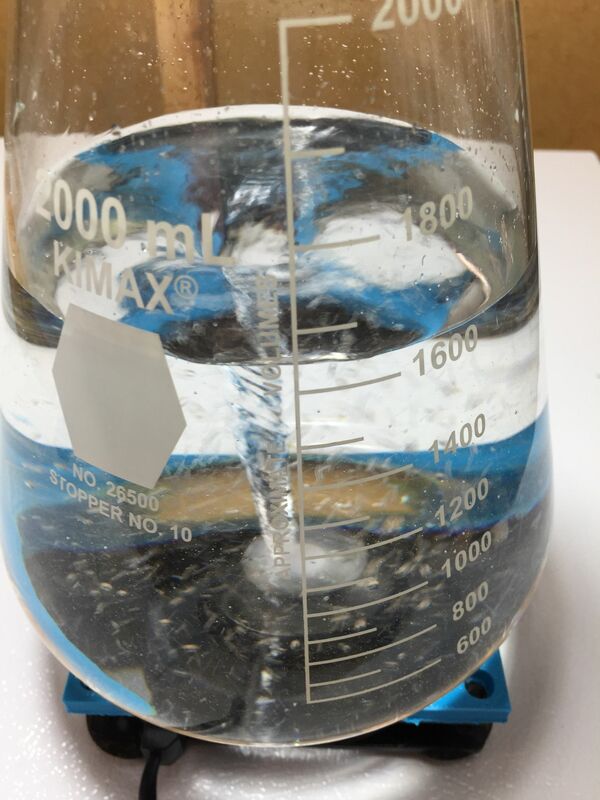 Hmmm… did you feel like the 1″ stir bar aligned up with the magnets well? What magnets did you use? I can turn my fan up to full speed and not throw the bar. Love seeing the different items and objects your coming up with on your printer. I haven’t made a stir plate before but have read placing the magnets to close to the fan motor can cause issues/early wear. Any truth to that? 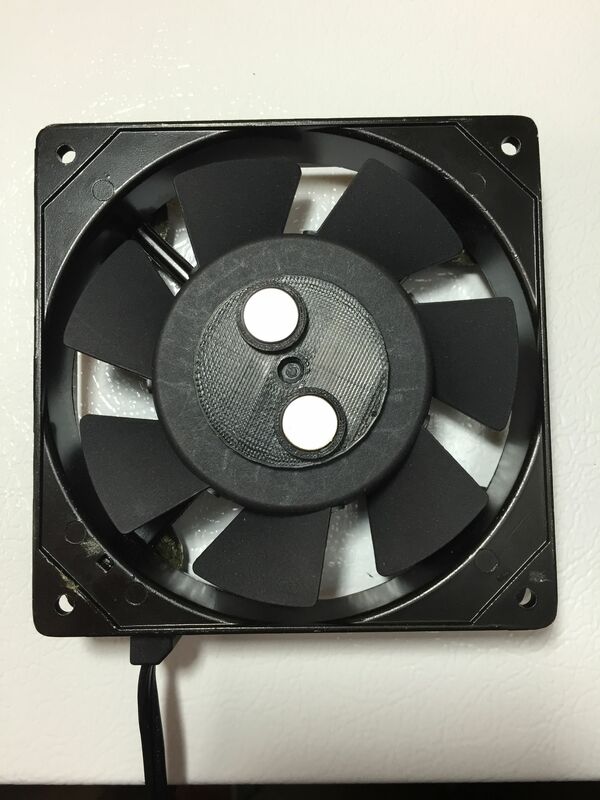 Why do you need the magnet mount rather than just gluing the magnets to the fan? You can certainly do it on your own. It can be difficult and frustrating to accurately place magnets. These magnets are strong enough that they don’t want to do what you want them to do. But, is it possible… yes. This is an aid to easily get great placement. TAKE MY MONEY! You should sell those magnet mounting-thingys! I did it like that to keep them thinner to save material, save wear on the fan and also I was thinking the heavier it was the greater possibility it would throw off the balance. I’ve thought just a little about producing to sell, but I don’t know that I want to roll these out into production with my printer. If anyone has some plastic injection molding contacts, I’d happily entertain a discussion on that. Alternatively, I may consider producing a them myself, if someone actually wants to sell them individually. Sounds like you’ve got a cool idea on the arduino stir plate. Would love to hear more. Send me an email if you want to chat.